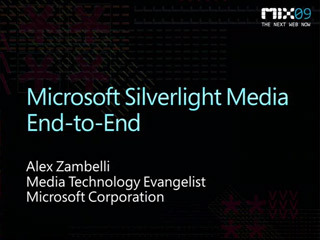 The Microsoft platform for delivery of video and rich media experiences has fundamentally changed and grown significantly since the introduction of Silverlight and IIS Media Services several years ago. Come learn about the encoding tools, digital rights management components, transcoding services, player development frameworks, analytics tools, content management systems and other tools and frameworks which comprise the Microsoft Media Platform (MMP). I was surprised to see that DirectShow wasn't mentioned anywhere in this presentation, not even in the "how it used to be" slides. As far as I know (PLEASE correct me if I'm wrong), even though it has been unsupported and undocumented since 2005, DirectShow remains the only way to implement filters for media playback, encoding, decoding, device interaction, or other low-level functionality on the Windows platform. So, as long as your application fits one of the standard scenarios that Microsoft enables with the high-level tools described in this presentation, you're in good shape. If not, you'll be spending a significant amount of time with Google trying to unravel the mysteries of DirectShow. DirectShow isn't explicitly mentioned, though yes, you could certainly use DirectShow to, say, implement a native Smooth Streaming source filter for Windows Media Player. We enable this scenario through the availability of the Smooth Streaming Client Porting Kit, but it's up to the developers to decide whether they want to use DirectShow, Media Foundation, WM Format, QuickTime, or any other media API to implement the client component. Note that I didn't mention any of those by name either. But I get your point - I could've been more precise. DirectShow is not the only way to implement native media apps on Windows. Media Foundation (MF) is the newer, modern media API. That's what WMP uses primarily these days. The focus of the Microsoft Media Platform is on streaming video. It's not meant to address local capture/encode/decode/playback (e.g. AVCHD acquisition) scenarios, but its goal is to enable over-the-top scenarios.